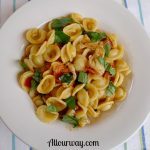 This is a piquant healthy pasta dish made with cherry tomatoes, fennel, garlic, basil, tomato paste, red pepper flakes and Pecorino. 1/2 pound medium shrimp peeled, deveined and sliced lengthwise. Reserve 1 1/2 cups of the salted cooking water, then drain and set pasta aside. Meanwhile, heat 2 tablespoons olive oil in a large skillet over medium-high heat. Add the chopped fennel bulb and 1/2 teaspoon salt and cook, stirring occasionally, until golden brown, 6 to 8 minutes. Reduce the heat to medium and add the garlic, tomato paste and red pepper flakes. Cook, stirring, 2 more minutes ( add a splash of the pasta water if the mixture is sticking). Stir in the tomato, shrimp, 1/2 teaspoon salt and 1 cup of reserved cooking water. Bring to a simmer and cook, stirring occasionally, until the tomatoes are saucy, about 6 more minutes. Add the pasta and cheese to the sauce and toss to coat. Drizzle with olive oil, season with salt and more of the reserved pasta water to loosen, if necessary. Stir in the basil leaves and fennel fronds. We chopped the fennel bulb in the food processor. This made it quick and easy.